Great performance! Bravo for your excellent focus through that long intro. After the first few seconds, you got into character, you looked right at the camera and you drew me in as a listener. All this before you even started singing. You were totally engaging through the whole song, your look was right and your vocal sound was satisfyingly intense. I liked your use of the VoiceLive Play doubling effect. Whenever I hear singers using an intense, gritty sound like this, I always feel compelled to warn them not to fall into the trap of misplaced effort and excess vocal tension. Remember, you should SOUND like you are in pain, without actually FEELING any pain! There is a healthy and an unhealthy way to get that gritty, edgy sound. I can see that your body is engaged but I worry that too much effort may be weakening your vocal power. To check this, I recommend you use a tension band for home practice. Voice expert, Dane Chalfin talks about how to do this in this video. Start watching just after the 2-minute mark: http://www.voicecouncil.com/your-vocal-health-gig-bag/ Dane takes a giant elastic band, stands on it, then pulls up on the ends with his hands. If you do this while you sing, you are instantly going to feel the benefit of good posture and full body support for the voice. It should give you access to even more power with less effort. I picked Manuela as a finalist because of her excellent focus that draws in the audience. My Name is Manuela Segovia. 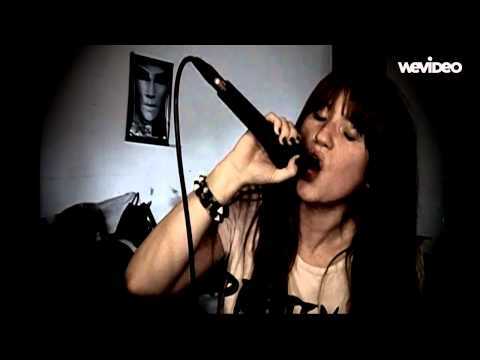 i am from Argentina and i want to share a cover version of the song “No Spech” from the “Guano Apes” Rock Band. This version was recorded by a cam mic from air and i used a TC helicon gear “voicelive play” for effects.